1. Frameless glass shower enclosure. This is a very popular option right now because of its flexibility; a frameless glass enclosure lends itself to any style, whether it's a clean, sleek design that appeals to modern tastes or a simple and understated one with an elegant and classic look. The glass itself is fairly easy to clean and maintain; it’s even more so if you get glass with a finish baked on that repels soap scum and water spots. 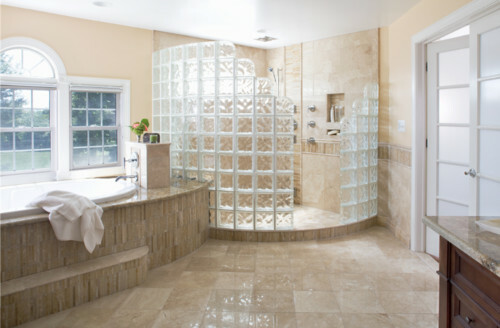 Overall, frameless glass is a great way to showcase your shower. 2. Aluminum and glassshower enclosure. Need a little something more to spruce up your shower? Don’t be afraid to be unique and try a shower surround that has flair. Created with glass panels set into an aluminum frame, this shower enclosure mimics the look of the tile in the back of the shower. The dark metal mixed with the clear glass gives the enclosure an eclectic feel. 3. Glass block shower enclosure. Eliminate the need for a door with a glass block enclosure. Glass block surrounds are versatile, and there are textured patterns on the blocks themselves. They have strong lines and give your bathroom a clean, cool look. The options are virtually limitless with glass blocks. You can find different block styles, thicknesses and even colors. 4. Sliding enclosure.Want the beauty of glass but don’t have the room for a swinging door? Try a sliding glass door, a very practical space-saving option that’s also stylish.Sliding doors can be customized to fit any style and space, and are a great way to show off your shower and still have room for other bathroom fixtures. Looking for a sliding glass door on a budget? Try a partially frameless sliding door. It will give you an airy look without breaking the bank. 5. Tub enclosure. Just because you have a tub doesn’t mean you are stuck with a shower curtain. Tempered hinged glass can give you the best of both worlds: the ability to reach the fixtures and the ability to keep water in the shower. Also, tempered ⅜-inch frameless glass is very durable, so even if you bump the panel against your toilet or vanity, it won’t damage the glass.Tempered glass can be sandblasted to create a frosted look, providing some privacy as well as looking good. Have a little fun with a combination of frosted and clear glass. 6. Textured glass enclosure. If you want privacy without the frosted look, try a glass with texture. The beautiful textures are enhanced with water running down the glass and create a spa-like feel. Textured glass also allows for a see-through effect while masking specific details, making the bathroom seem larger. 7. More than one entrance. Who says showers can have only one entrance? Having more than one way to get in and out of the shower is more than just practical. It creates so many design options and can give a bathroom a his-and-hers feel. It also will give you more space in the shower. A fully frosted surround gives this bathroom a very luxurious atmosphere, while the exposed sides of the enclosure give the room an open feel. This is great for tall, narrow bathrooms. Looking for something a little less closed off? 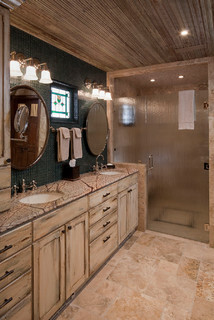 Try frosting only a portion of the panel to provide privacy while still showing off your fabulous shower. 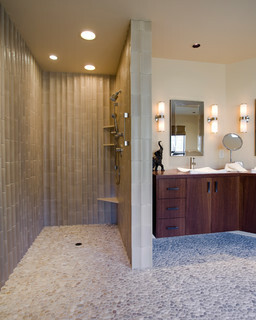 Contemporary Bathroom by Salem Design-Build Firms Kaufman Homes, Inc.
8. No shower enclosure.Some bathroom layouts don't require an enclosure at all. A consistent floor material makes this bathroom seem expansive. The open shower with just the tiled wall separating it from the vanity gives the bathroom a nice feeling of unity. Worried about keeping the heat in? Add a heated shower floor or a heat lamp in the ceiling (or both). 9. Framed enclosure.Framed enclosures are a popular option because they are a low-cost solution to the age-old problem of how to keep water in the shower. But just because the shower is framed doesn't mean it can't be stylish. Instead of polished brass, try a chrome finish for a look that can be classic or modern. Adjustable panels at the top allow for venting in this fully enclosed shower as well as give it a little flair. Want something affordable and traditional? Go with an oil-rubbed-bronze frame — and don't forget to add a drain cover to match. 10. Tile and glass enclosure. 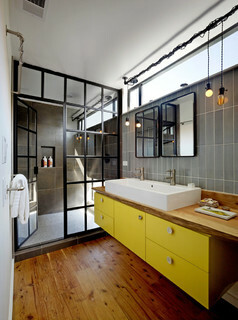 A frameless glass door combined with tiled walls gives this bathroom an open look. A tile surround with frameless glass windows not only makes the shower feel bigger on the inside, it also allows plenty of light in. Need something more daring? Don't be afraid to mix materials. 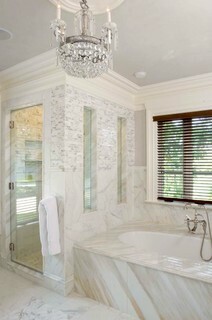 Try a darker tile with rippled glass.